FOR THE STEAKS: pat steaks dry with paper towels; season both sides with salt and pepper. Heat oil in 12 inch skillet over medium high heat until smoking. 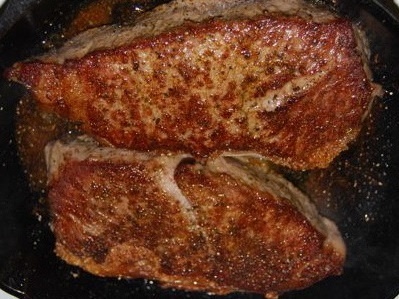 Lay steaks in pan, leaving ¼ inch between them. Cook, not moving steaks, until well browned, about 4 minutes. Using tongs, flip and continue to cook until steaks register 120 to 125 degrees(for medium rare). 3 to 7 minutes longer. Transfer to platter; tent loosely with aluminum foil. FOR THE HERB SAUCE: return now empty skillet to medium low heat; add shallot and cook, stirring constantly until lightly browned, about 2 minutes. Add wine and bring to simmer, scraping bottom of pan to loosen browned bits. Add steak sauce base, vinegar, and any accumulated juice from steaks; return to simmer and cook until slightly reduced. About 1 minutes off heat, whisk in butter, chives, parsley, and tarragon; season with salt and pepper to taste. Spoon sauce over steaks and serve immediately. Pulse onion, carrots, mushrooms, and garlic in food processor into 1/8 inch pieces, 10 to 12 pulses, scraping down bowl as necessary. Heat oil in Dutch oven over medium high heat until shimmering, add beef and tomato paste and cook, stirring frequently, until beef is well browned, 8 to 10 minutes. Add vegetables mixture and cook stirring occasionally, until any exuded moisture has evaporated, about 8 minutes. Add wine and bring to simmer, scraping bottom of pan to loosen browned bits. Add broth, thyme, bay leaves, and peppercorns; bring to boil. Reduce heat and gently boil, occasionally scraping bottom and sides of pot and skimming fat from surface, until reduced to 2 cups, 20 to 25 minutes. Strain mixture through fine mesh strainer set over small saucepan, pressing on solids to extract as much liquid as possible (you should have about 1 cup). Sprinkle gelatin over top and stir to dissolve. Bring to boil over medium high heat and boil gently, stirring occasionally, until reduced to ½ cup, 5 to 7 minutes. Removes. From heat and cover to keep warm. Substitute brandy for white wine and red wine vinegar for white wine vinegar. Omit butter, chives, parsley, and tarragon. In step 2, and ¼ cup heavy cream, 2 tablespoons rinsed green peppercorns, and ¼ teaspoon minced fresh thyme to skillet along with Steak Sauce Base and vinegar. Substitute ruby port for white wine and balsamic vinegar for white wine vinegar. Substitute ¼ teaspoon minced fresh thyme for chives, parsley, and tarragon. End.